5 | 1100 students enrolled. 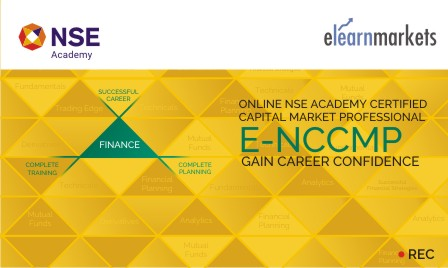 NSE Academy Certified Capital Market Professional (E-NCCMP) course is jointly certified by NSE Academy & Elearnmarkets (NSE Academy is a subsidiary of National Stock Exchange of India). This course is a perfectly designed capital market course, to create a powerful knowledge bank on various tools and techniques required in depth understanding of the functioning of capital markets. The course simplifies financial jargons like Equities, Currency, Mutual Funds, Derivatives and IPOs. It is a perfect blend of Fundamental Analysis, that help investor pick the right stock and Technical Analysis which will provide the correct entry and exit timing and prices of the stock through the study of charts. This Capital Market course will empower the Investors with knowledge about the markets so that they may be able to take the right decisions & not lose money by blindly investing based on investment advice provided by so called market pundits. Online NCCMP is the course to provide that knowledge. The Objective of capital market course is to equip the students with necessary stock market theoretical and practical know how and provide the students an academic base so that students can apply the same in equity markets research for wealth creation. It introduces you to the process of how to find and analyze stocks, proper entry and exit time of the stock, determine the risk of a stock investment or trade, understand why markets move the way they do, and help you choose the right trading style as an expert trader for your personal goals. This course fulfills the objective of providing all relevant tools and techniques to understand the various facets of the capital market covering practical exposure. Students enrolling for this programme will be entitled to attend weekly webinars for 2 months conducted by Elearnmarkets, free email query support, Question & Answer platform support and a Certificate by NSE Academy & Elearnmarkets.There are mock tests designed after each session to check and ensure the level of understanding of the students. All the knowledge content is provided by Elearnmarkets & NSE Academy. Suitable for Candidates who want to gain a thorough knowledge on capital market, particularly students of professional courses.Online NCCMP is useful course for fresher’s who would like to get introduced to the basic market terminologies and concepts. It provides knowledge fortification & exposure to practical application for graduating students, serving as an effective resume builder and ideal preparation for future career. New Investors, Retail Traders, and Financial Service Professionals shall also benefit from this course as not only do we provide the book knowledge, but also the mentoring and training guidance, to help each student achieve their goals for investing or trading. It offers all the benefits of being online, thus helping students learn at self-pace and continue studying while working. Under this course the candidate will be required to appear for the NCFM examination. Please note that the candidate will get the Certificate of Completion of NSE Academy Certified Capital Market Professional after successfully clearing the NCFM Examination. This exam will be hosted by NSE for which the candidate needs to go to the NSE approved test centre. Register yourself on NSE website by clicking here: NCFM: Registration. NCFM ID and password will be generated. This ID and password will be used for registering for the examination. A confirmation will be sent by NSE directly to you for the seat booked. This confirmation email may not be sent immediately but may take atleast a week to be received by you before the date of examination. Also, your hall ticket will be uploaded in your NCFM account itself. Qualifying Percentage: 50%.There is no negative marking for this module. How to receive your Certificate? You can download your certificate from the "My Certificates" tab available on your Elearnmarkets dashboard within 10 days from the date of Certificate application done successfully.